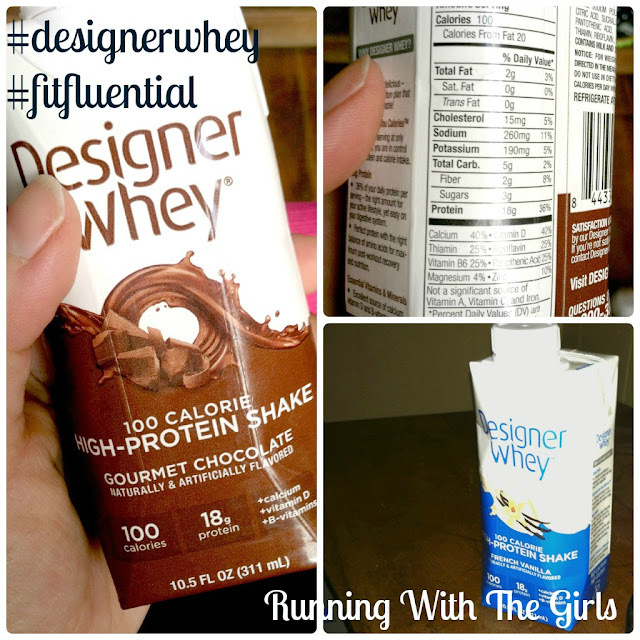 4 weeks into marathon training (again), and I'm more than excited that I've been able to fuel and recover with Designer Whey. My body has been on the finicky side before when training for marathon, which has lead me to be rather picky about what I put into my body when I'm putting in the work and the miles. I drink water all day long. I've blogged about this before, that I drink nearly a gallon of water every single day. When I can add some flavor to the water and protein, and only 50 calories, I'm sold. The little packets make this easy to just toss into my school bag or gym bag and go. I even tried out the Protein 2Go with my SodaStream. Be warned, there was quite a bit of extra fizz, but after waiting a long, long time for the fizz to go down, the flavor was amazing. 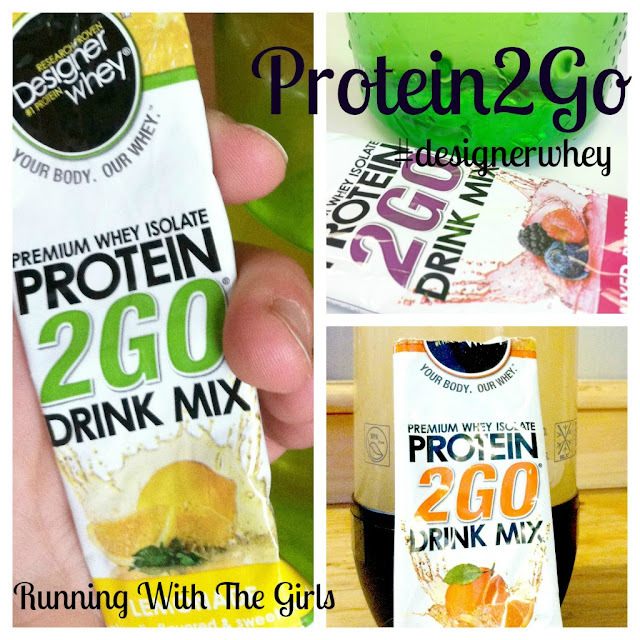 I now have a fun new way to enjoy my Protein2Go with my SodaStream. 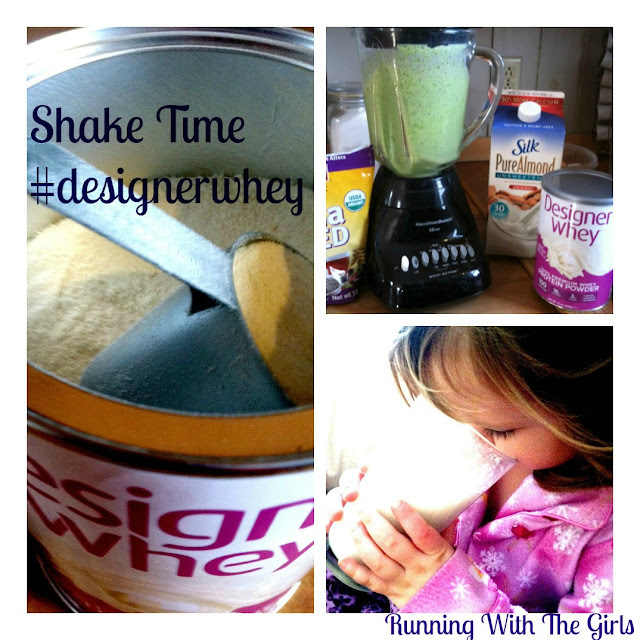 Now, this is when I am not happy to have a marathon-training husband, because the day after I received my Designer Whey goodies, he decided to wake me up to tell me how incredible the Vanilla Shake was. Really? First, he stole my shake. Second, he had to wake me up? Not fair! The next morning I grabbed my Chocolate Shake and took it to school with me. I was not allowing him to get the last shake. I'm glad I did. The shake was amazing. But I had to see what I was missing with the Vanilla Shake, so I went online to see if Designer Whey was sold anywhere in my area. I was beyond ecstatic to see that my local Rite Aid sold them, so I had to make an emergency trip there and luckily they had one 4-pack left, so I bought it immediately. And I'm happy I did. The vanilla shake is amazing as well. And it is only 100 calories. 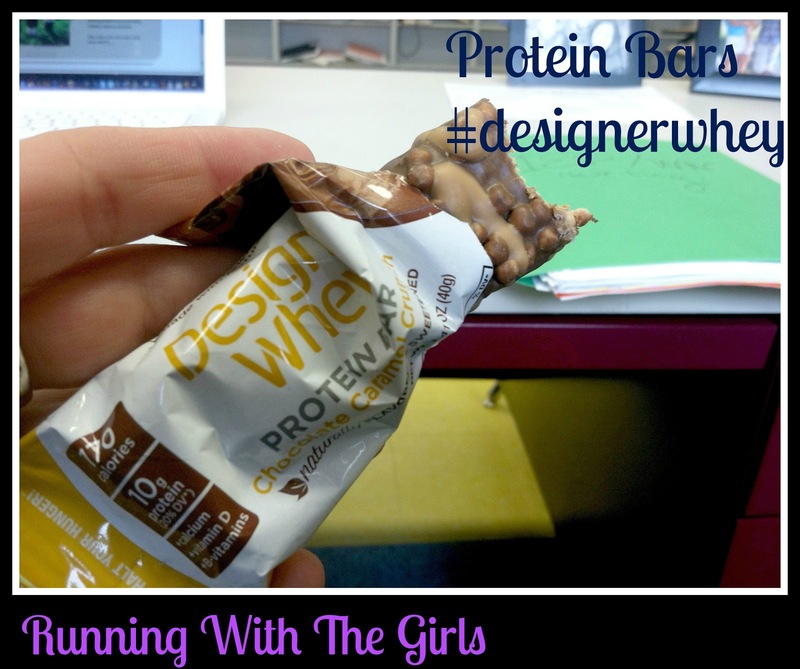 Designer Whey's protein bars were quite tasty. While they are only 170 calories and have 10 grams of protein, these bars were packed with tons of flavor and definitely provided me with a great mid-day snack at school. I enjoyed tearing into one of these bars just before a hard run, knowing I was going to need the energy for those killer mid-week speed workouts of the Hanson Marathon plan. I was sent Designer Whey's French Vanilla and White Chocolate protein powders. The protein powder is packed with 18 grams of premium natural 100% whey protein and only 100 calories per scoop. I immediately fell in love with the White Chocolate. Both flavors are amazingly smooth and are very easy to add to my favorite recipes. I've made pancakes with both flavors and I've made quite a few tasty smoothies. 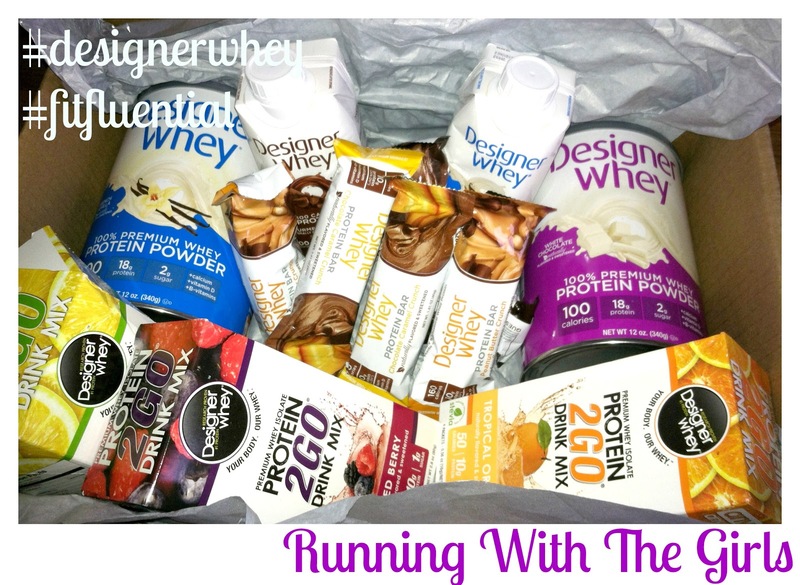 If you'd like to try out Designer Whey, you should check out the Designer Whey starter kit. It comes with Designer Whey French Vanilla Premium Whey Protein Powder, Designer Whey Peanut Butter Crunch Protein Bar, Designer Whey Caramel Chocolate Crunch Protein Bar, Designer Whey Triple Chocolate Crunch Protein Bar, Designer Whey Premium Isolate Protein 2GO Drink Mix Lemonade Packet, Designer Whey Premium Whey Isolate Protein 2GO Drink Mix Mixed Berry Packet, and Designer Whey Premium Whey Isolate Protein 2GO Drink Mix Tropical Orange Packet all for $20.13. That's a heck of a deal. To find out more information about Designer Whey, find them and like/follow them on Facebook, Twitter, Pinterest, YouTube, Google+. Disclamier: I was provided Designer Whey for the purpose of a review through FitFluential. I was not compensated for this post. All opinions expressed here are 100% my own. Oh it all looks delicious. Saw another review on the products and it made my mouth water. White Chocolate Protein Powder?! I'm going to have to check this company out! I drink at least 60 grams of protein a day. I always drink Click, but I might need to shake it up a bit! Mmm...I'd love to try that white chocolate protein powder. Sounds delicious! Great review!!! These all look great! I love the premade protein shakes...anything I can grab and go on the run! The white chocolate was delicious...I am bummed that the Topsham Rite Aid didn't have it, but I am in your area again this weekend. I WILL be buying it! Everything looks delicious! I would love to try the white chocolate protein powder, I love white chocolate!